This birthday card will add cheer to your daughter's day with its vibrant colors, festive balloons, and confetti! Birthdays are a perfect time to express all the wonderful thoughts you have about your children, and this birthday card does just that! It will let your daughter know that you are so proud of her and all that she has accomplished. 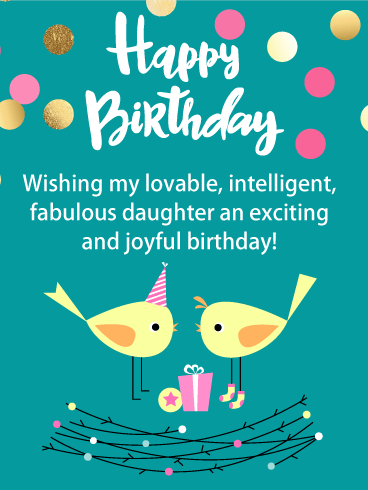 Make sure to bring joy to your daughter's day with this happy and positive birthday card! Happy Birthday - To My Awesome Daughter! Words can't describe how thankful I am to have you as my daughter. I am so proud of you and all that you have accomplished over the years. I can't wait to see what you achieve over the years to come. May your birthday be everything you are hoping for. Sending your daughter a birthday card with pretty roses is a sure way to make her feel special. The pastel pink flowers are displayed beautifully and your daughter will just love them! This birthday card will add happiness to her day when she reads that you love her with all your heart. 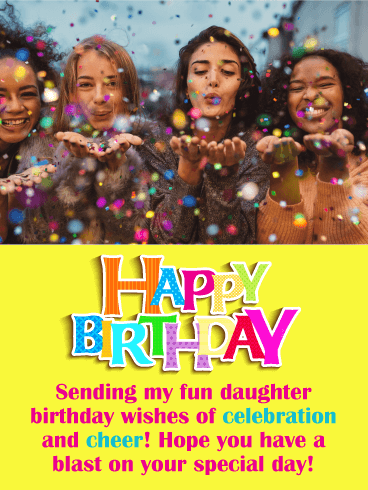 It was designed for a parent to send a wonderful birthday message to their daughter, so be sure to send it soon to get the celebration started! This great birthday card features a little puppy that is so excited that it's your daughter's birthday, and he can't wait to meet her! The colorful birthday balloons and presents add an element of celebration, and the message explains how thankful you are to have your daughter in your life. This will certainly touch her heart! 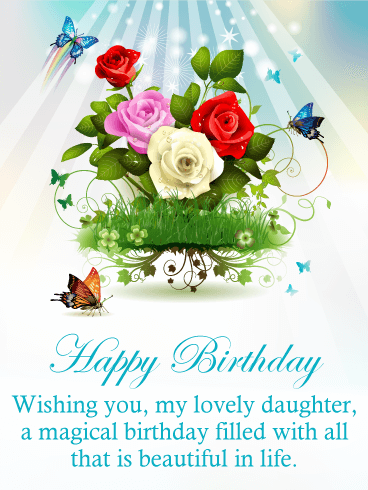 So send this colorful birthday card over to your daughter to wish her the Happy Birthday she deserves! If you want to make your daughter happy on her birthday, then send this adorable birthday card her way. It features two little celebration birds complete with a birthday hat and present. So cute! The decorative pink and gold colored confetti add to the excitement and give it a festive look! 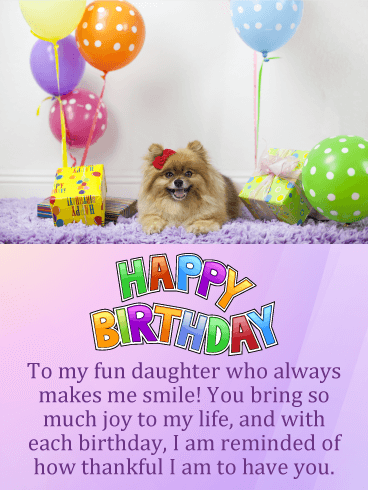 Send this birthday card out today to wish your daughter an exciting and joyful birthday. She will be so happy you did! 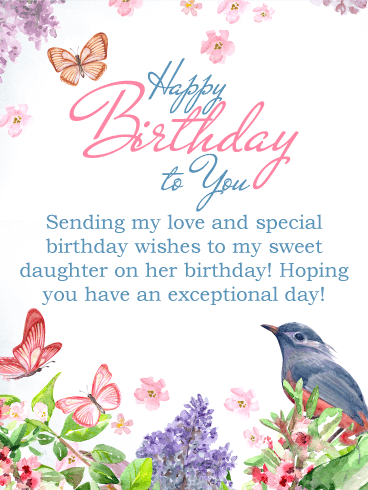 This exceptional birthday card that was created just for your daughter, is filled with lovely images of butterflies, flowers, and a beautiful bird. It features the words Happy Birthday to You in fancy script lettering that really adds to the beauty of this birthday card. Your daughter will appreciate that you took the time to find such a special greeting card just for her. The thoughtful message will remind her of how much you love and care for her. Birthdays are an excuse to celebrate and have the best time. So there is no better time than now to send your daughter wishes of celebration and cheer for this special day that only comes once a year! This birthday card has it all, it features girls out celebrating with confetti, cheerful colors, along with a fun message. 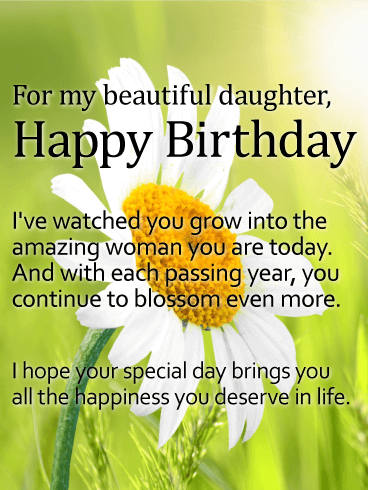 You can't go wrong by sending a fabulous greeting card like this to your daughter on her birthday! Sparkling lights, vibrant flowers, and rainbow colored butterflies give a magical touch to this birthday card that your daughter will especially like. 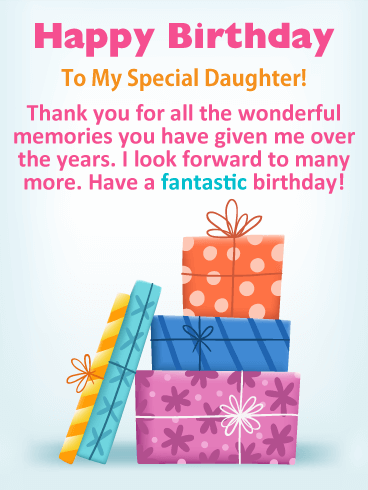 It will put a smile on your daughter's face when she views the fantastic image and reads the special birthday message that was written just for her. 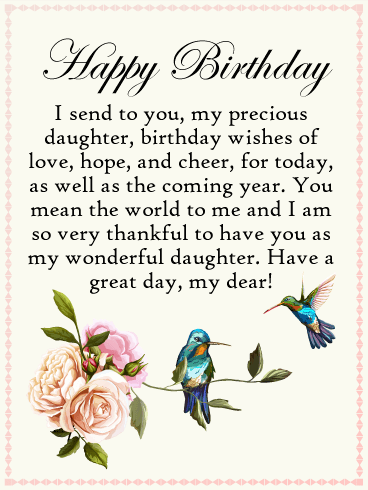 So send this birthday card that stands out from the rest, to wish your daughter a birthday filled with everything that is beautiful in life! Who can resist smiling when they see such an adorable kitty! The cat is wearing a pink hat that says Birthday Girl. So cute! 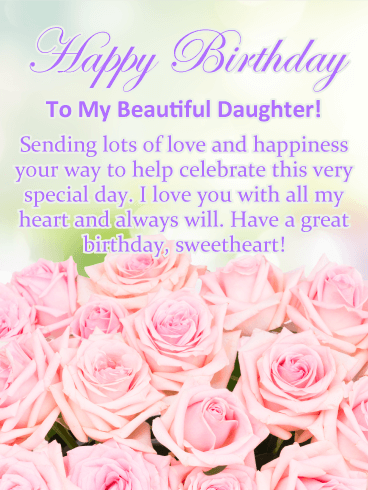 This birthday card also features a pretty pink background, festive Happy Birthday lettering, and a message for your daughter that will let her know how much you love her. This birthday card will add joy to your daughter's day! 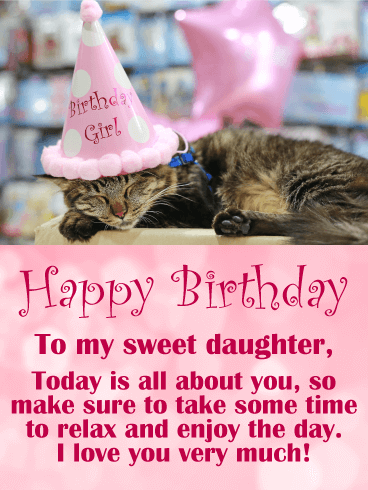 So send this kitty on her way to greet your daughter on her special day! Everyone loves a yummy cupcake on their birthday, especially one with colorful sprinkles and sparkles! This fun and bright birthday card would be perfect to give to your daughter on her special day. It will get her day started with a smile and appreciation! 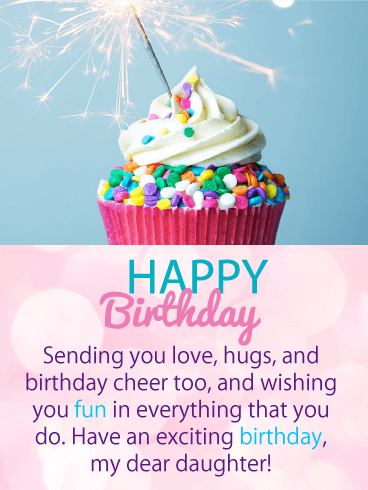 A birthday card that sends love, hugs, and cheer, such as this one, is surely worth sending, so let the celebration begin and by getting this delicious cupcake over to your daughter without delay! For some, the best part of a birthday is the presents they will receive! So when you send this birthday card to your daughter, she will be reminded of all the birthday presents that will be coming her way! It features colorful gift boxes and a caring message that was written just for your daughter. It thanks her for all the wonderful memories she has given you, making this a special birthday card that your daughter will love. Dazzle your daughter on her birthday with this spectacular sparkling birthday card! It features beautiful pastel butterflies and pink flowers that make it a lovely site indeed! 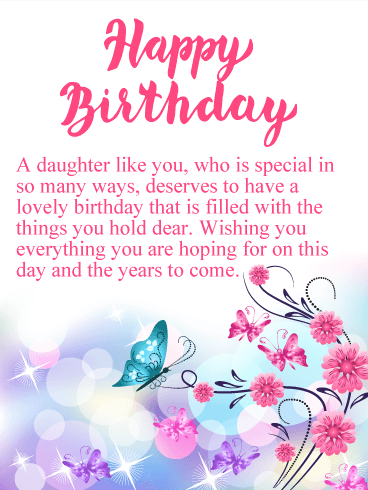 This birthday card will express that your daughter is special in so many ways and wish her everything she is hoping for! Receiving a birthday card such as this will make your daughter's day, and she will love you even more for it!